George W. Bush Presidential Library Dedication: Presidential libraries should be sources of accurate information, not shrines to former presidents. Will the Bush Library Address Torture? Americans should be outraged if it doesn’t. In 2007, I had the privilege of becoming the first director of the Richard Nixon Presidential Library and Museum. My job was to move Nixon’s presidential materials from the Washington, D.C. area, where they had been kept as federal property because of the Watergate investigation, to California, where Nixon’s friends and supporters had built a private library in 1990. My job involved transforming the once private library, which had a reputation for being a national center of Watergate denial, into a public, nonpartisan facility. It’s true that I had managed to anger Nixon loyalists. As part of the Nixon Library’s rebranding mission, I had brought in serious critics of the former president—notably Elizabeth Drew and John Dean—to the library and vowed to have an honest exhibit on Watergate. And the Nixonians made their feelings known. In 2009, the private Nixon Foundation sent a letter to every living former president denouncing me personally—“Who is this Naftali,” a puzzled President Bill Clinton is said to have asked, “and why should I care?”—for messing up the library system by trying to achieve nonpartisanship in Yorba Linda. The Bushies were apparently arguing for control of the temporary exhibit gallery to prevent it from being used by a future federal director for an exhibit that might cast Bush 43 in a negative light. The creation of every new presidential library involves negotiations over an agreement—a treaty—between the federal government and the former president and his representatives. Called a Joint Use Agreement, the contract divides up responsibility for the space at the library between the private presidential foundation, which is usually dedicated to promoting the positive legacy of a president, and the American people. Areas controlled by the private presidential foundation, such as the impressive Air Force One Pavilion at the Reagan Library, can have partisan events such as Republican presidential debates. Those spaces controlled by the National Archives on behalf of the American people, however, are legally mandated to be nonpartisan. In dealing with the Bush Foundation, the National Archives apparently held the line—as it did with the private Nixon Foundation—and, according to the George W. Bush Presidential Library and Museum website, all of the galleries that will be dedicated today are indeed controlled by all of us. If the final agreement is anything like the treaty governing the Nixon Library, the National Archives has veto power on your behalf over all exhibits and programs at this new presidential library. That’s right. Whatever you think of President George W. Bush, you control the Bush Library. And you should, since every year you will spend about $4 million on it—the same amount of public funds spent on every one of the 12 other presidential libraries. One of the misconceptions about presidential libraries is that they are supposed to be shrines. (Don’t worry if you believe that—many presidential relatives do, too.) But Congress is not interested in creating shrines to the branch of government at the other end of Pennsylvania Avenue. It is one of the strange outcomes of the separation of powers doctrine that one branch has to pay to archive and display the documents and trinkets of a competing branch. In recent years, Congress has shown its displeasure by trying to narrow the streams of public money that go to presidential libraries. The younger President Bush had to raise a lot more money than his father, not just because construction costs had increased in 15 years, but because Congress expects the friends of presidents to create an endowment to help shoulder the burden of maintaining the buildings forever. There’s nothing wrong with that necessarily. But in its zeal to reduce the public burden for these libraries, Congress has made them even more vulnerable to presidential friends and family. Unwilling to use public funds for these programs or exhibitions, Congress expects the library’s private presidential partner to foot that bill. The effect is that the National Archives finds itself passing the tin cup to raise money for museums, exhibits, and book talks from groups that are not interested in promoting objectivity. The National Archives is nonpartisan; it is supposed to act in the spirit of open government and transparency and be a leader in the custodianship of history. Presidential families (though there are notable exceptions like the Truman, Johnson, Ford, and Carter families, and Caroline Kennedy Schlossberg) often oppose nonpartisan programming and have often placed obstacles in the way of releasing materials. Another misconception is that, like it or not, presidents and their loyalists deserve a watering hole. Since we Americans regularly “throw the bums out,” regardless of ideology, there are almost as many Democratic presidential libraries as Republican ones. So, why not let them be? Democrats can visit the Clinton Library and Republicans the Reagan Library. I have to admit that this was my view until I ran one. These presidential libraries, however, have an educational mission that is much more important to the country than the reputation of a former president. Depending on the location, these libraries receive between 60,000 and 400,000 visitors a year. And students and teachers around the country use these libraries’ online resources in the classroom. You cannot look at the faces of the kids and their teachers that come to your museum without feeling pangs of regret if what they see is not as accurate and informative as it could be. At the Nixon Library, 12,000 school kids on formal school tours visited each year. Before the National Archives took over in 2007, nearly 200,000 students had been taught that the Democrats used Watergate to overturn the electoral result of 1972 and that Richard Nixon did nothing that presidents before him had not done; the only difference was that he got caught. Will the George W. Bush Library echo the insecurity of the president’s supporters who worried about letting the National Archives put up a future torture exhibit? The test will not just be the permanent galleries that we get a look at for the first time this week, but the tenor of the programs sponsored by the library. Will the library invite serious writers who opposed the Iraq War in the spirit of the Johnson Library’s invitation to Robert Caro? Will the school tours be run with an educational or a rehabilitative mission for the reputation of the 43rd president? And what about the temporary exhibits sponsored by the library, will they be nonpartisan or just echo chambers for Bush-era White House spin? 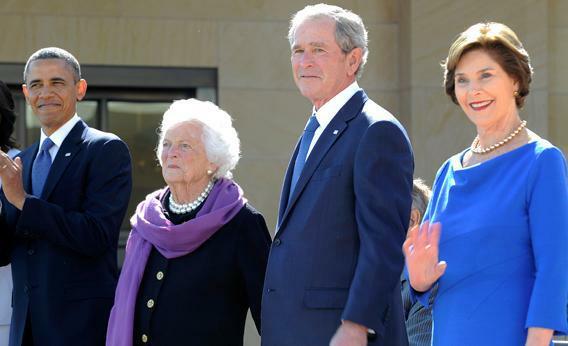 The new Bush Library will be as nonpartisan as you want it to be. All of the libraries read the emails, letters, and social media about how they are doing their job and how they could do it better. If you are a teacher, contact the library and see what online materials they have for your students. And if you consider the materials one-sided, let them know. The Bush Library, like all other presidential libraries, will have an education specialist, paid by public funds, whose job will be to foster an inviting, “no-spin” zone. If the public wants serious discussion about No Child Left Behind, the consequences of the Iraq War, or why the government crossed the line and used torture after 9/11, there is no good reason why these discussions cannot occur in the same building as where the documents that explain those policies exist. Academic historians long ago shifted their focus away from the White House, but for most of us American history is still heavily presidential. What we learn about these outsize individuals marks what we think about ourselves. If children are taught that truth lies solely with the presidents of one stripe or another, that no president did wrong, that all presidents were consistent in what they thought or did, and that history flows from the Oval Office, then we invite a continuation of the toxic national politics that have made this country nearly ungovernable.